These are the top of the line knives from Kikuichi. The Kikuichi Elite Warikomi Damascus Tsuchime Knives are high quality knives made using the Kasumi method, a traditional Japanese style of knife making that laminates different materials together to take advantage of the strengths of each. The knives in the Warikomi series are made with a core piece of VG-10 steel providing an extremely sharp cutting surface with excellent edge retention. The exterior of the knife is clad with 16 layers of stainless steel (8 per side) to protect the blade, promote stability and provide stain resistance. The knife is then finished by hand hammering the layered metal and tempering it with heat. The result is a unique Tsuchime Damascus style knife with a rustic look that helps reduce food sticking to the sides of the blade. Kikuichi then finishes the knife by riveting a compressed wood handle to provide optimum balance and durability. Hand wash only. 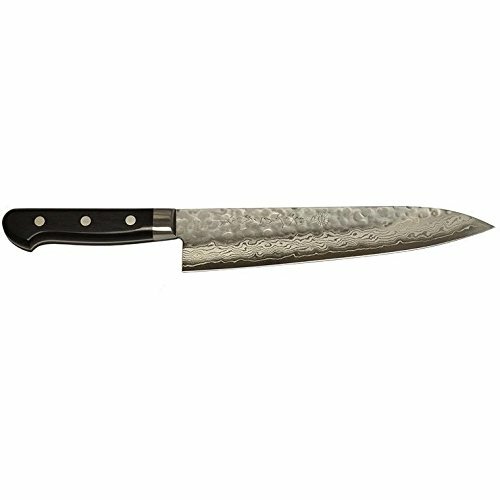 Measures 8" or 210mm on the blade.Handmade by Kikuichi's craftsmen in Japan.